Being a lifelong guitarist, playing in cover bands, as well as writing and recording original material, HENRIC BLOMQVIST has made many friends during his long and diverse musical career. Now, with the release of his first solo album, “All of Your Illusions”, all the friendships formed, along with years of hard work, has paid off. 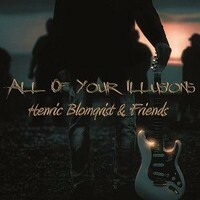 HENRIC BLOMQVIST & FRIENDS, as the band is referred to, is a collection of talented musicians that together, have written and recorded a very catchy and guitar driven album. Although there is four different singers scattered among the album, the recording spotlights this guitar player’s talented axe playing and songwriting ability. And with the contributing artists that have come to his side, he has proven that he is a well-respected musician among his peers. Originally trained as a classical guitarist, BLOMQVIST’s first love was, and has always been, the electric guitar and rock n’ roll has been boiling in his blood from an early age. Along the way, he’s played in some good bands, but his biggest moment came in 2009 when he was asked to play a club date with Rock God vocalist DOOGIE WHITE (DOOGIE WHITE, MSG, RAINBOW, MALMSTEEM) and shortly thereafter, played with him again on WHITE’s return trip to Finland. And now five years later, he (WHITE) has returned the favor, contributing vocals on the song “Lonely As I Am”. On this 10 song, independently released album, “All of Your Illusions”, you get a mixture of many different styles of rock n’ roll. The opening track “Place of Fear” starts the album off on the right foot with a song that sounds like something reminiscent of JUDAS PRIEST and flows right into “Thunderbrigade”, a track that has an edgy power metal feel to it. As the album goes along, you get a taste of just how seasoned BLOMQVIST’s guitar playing is and the different roads this guy has seen throughout his time on stage and in the studio. There are power ballads, smooth instrumentals, up-tempo hard rockers and down-tempo rock n’ roll tracks that brilliantly mesh together to make up one hell of a nice album. With a really good solo release under his belt, HENRIC BLOMQVIST has built a strong foundation for future successes and is on his way to making the kind of music that he’s been itching to do his entire life. And with his talent and great songwriting ability displayed on this album alone, he will surely get the opportunity to release a lot more music and should finally get the attention that is long overdue. I would definately recommend this album to anyone that loves really good, straight-up rock n’ roll. Other contributing artists are vocalists JARI TIURA (STARGAZERY, MSG), JUKKA NUMMI (ANGRY MACHINES, RAINBOW SHAKERS, MYON), JOHAN MATTJUS (SOLID FACES, STORMWING), JONAS KUHLBERG (MYGRAIN) on bass, SVEN Wannäs (SOLID FACES, KAOS KREW, STORMWING) on Hammond & keyboards and ROGER SNELLMAN (SOLID FACES, TINDERBOX) on drums.